Character Mine: Chinese self-test freeware software program. Shareware for learning pinyin traditional or simplified Chinese characters.Flash-card program recommended for beginners and advanced students. Includes CC-CEDICT dictionary, image search and randomized font testing.Uses Windows predictive IME (Input Method Editor). Suitable for Windows 7, XP and Vista. Quickly build your Chinese vocabulary! This is a flash-card style self-test program for learning Chinese vocab, combined with the 100,000 + item community maintained and contually updated CC-CEDICT Chinese/English dictionary. The program continuously encourages you to form connections between the new items you are learning and your existing vocabulary database. Your existing database of characters is presented as an interconnected web, allowing infinite drilldown. Add items from dictionary or add manually. 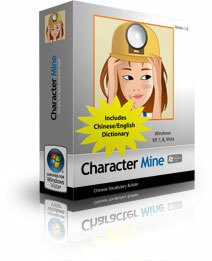 Character Mine HSK vocab packs available to download. New - Network or Dropbox compatible. Enter characters or just pinyin - beginner friendly. Traditional or simplified chararacter modes. Automatic vocab review after three months. Customizable or random fonts for testing. Complete software package - no locked down features or time trail.